Music has an uncanny effect on memory. It can direct a person to a specific place and time in their mind when a familiar song comes on the radio, when a nanosecond’s worth of a guitar lick is present in a television commercial, or when it’s heard in a movie. Music almost has same power as the sense of smell, triggering thoughts from so long ago. In September 2001 I was just starting my sophomore year of college, not yet 20. I remember the weather in West Texas was pleasant; not too hot and not yet cool enough for a sweater. My roommate and I had just seen Crosby, Stills and Nash play a gig in Dallas the night of September 8, 2001, and like with most concerts it takes us several days to come off Cloud 9. I remember the fantastic greatest hits-like set from the show, and the big, burly roadie type gent three seats down from us that sat stoic for most of the show, until the opening licks of “Southern Cross” hit everyone’s ears, and this guy jumps out of his seat in excitement, as if his chair was electrified. I was still laughing about that moment the morning I rolled out of bed on September 11th. However, the moment I sat down to catch some tv before heading to class I was no longer laughing. I have to admit, I was a little annoyed waking up to the sounds of a loud tv the morning of Sept. 11th. My roommate had left the tv set on, but had already gone to class. “Why did you leave the tv on, fucker?” I thought to myself. But, those thoughts quickly disappeared as I was watching the news. I knew why he left it on. Something was happening that I didn’t quite catch until minutes later. The tv reporters kept talking about a sky scraper on fire in NYC, but it still wasn’t registering. Clips of a plane crashing over and over into this building permeated the screen. “What is all this about?” I kept wondering. At first, I thought this was a clip from an upcoming movie coming out. Little did I realize that what the tv reporters were talking about was a terrorist attack on the World Trade Center. “Oh, My God” is all I could say, yet still in disbelief of what I was seeing. Footage of the attack played over and over, as did the footage of the first tower that completely collapsed. I was mortified, to say the least. And then, the unthinkable happened again: the second tower collapsed on live tv. My stomach completely bottomed out, and then bottomed out some more. I felt like I was in the ‘Twilight Zone’. The rest of that day on campus was strange, to say the least. McMurry University, as well as with every other college campus in the country, was literally a ghost town. Strange thing was is that I went to all of my classes that day. Classes weren’t cancelled, even though there wasn’t more than five or so students in each of my classes. I didn’t really know what to think about being one of a handful of students in class on a day that obviously didn’t warrant a reason to go. I suspect that most students stayed in their dorms to watch tv around the clock, contact family and loved ones to make sure they were ok. Part of me felt like this wasn’t really happening, like I fell down the rabbit hole, or something. Ultimately, I felt powerless in what I could do or say about the situation at the time. This terrible thing happened hundreds of miles away from where I was. In fact, NYC always seemed like an imaginary place to me, as I had never been. I’ve only known it from film or music. It wasn’t a part of my actual reality. I didn’t know what I could do to help, if I could do anything. I just hoped and prayed things weren’t as bad as they seemed. By mid-afternoon it seemed obvious that it was pointless to go to the rest of my classes. Most if not all classes eventually ended up being cancelled for the next few days. I sat in the sports grill with my roommate and a couple of other friends having a late lunch and being desensitized to all of the media reports. Eventually, I couldn’t stand watching the news anymore. I had to leave campus for awhile and attempt to process the events of the day, and digest the fact that I, along with the millions of other Americans, had just witnessed a major historical event to the likes of the attack on Pearl Harbor during WWII. I managed to take refuge in the one place in town I knew I could gather my wits: the record store. 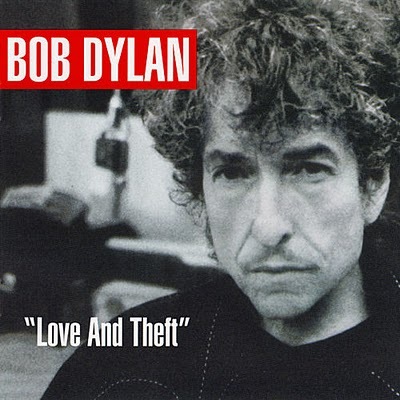 For months I had been eagerly anticipating the release of Bob Dylan’s latest album, “Love & Theft”, his follow-up to the astounding “Time Out of Mind” LP. I knew Dylan was on a roll creatively, and was entering a sort of renaissance in his work, so I knew “Love & Theft” was going to be stellar. It didn’t take long before I headed back to my dorm to listen to my new record, in hopes that I could drown-out the seriousness of the day. I remember passing all of the gas stations on the way home, seeing horrendously long lines over the panic of possible gas shortages, which made me realize just how funny we humans can be. Before I even walked through my dorm door, the shrink wrap was off the album packaging, the CD (yes, I was still listening to CDs in those days) was in my player, and the joyous opening riff to ‘Tweedle Dee & Tweedle Dum’ came blaring out of my speakers. ‘Summer Days’ and ‘High Water (For Charley Patton’ followed, putting me in such a great place mentally and spiritually. After nearly an hour the album was over and I was hitting the play button again. I probably listened to that album about six or seven times back-to-back that evening. By the time the seventh listen rolled around, I really began to think about the significance of the album’s release date, thinking about Dylan and his ties to yet another momentous time in American history. No one could have known in advance the events that transpired that day, and of course, Dylan never would have known such a tragedy would overshadow the release of his latest work. Of all the musicians that could have released music that day it strikes me as funny and strangely peculiar that it was Dylan who released an album. Yet, it was Dylan and that album that really helped me escape and numb my senses enough to put Sept. 11th and those few days afterwards into some sort of tangible perspective. Dylan’s mystique has been interesting and captivating over the years, anyway, but the release of “Love & Theft” on that day made the moment almost otherworldly. I know other musicians released albums that day, but I honestly couldn’t tell you what those albums were without doing some research. Dylan’s album, for me, was going to be the only bright spot on an otherwise dark and dreary day, even with the sun shining in a relatively empty sky. “Love & Theft” doesn’t mark the day of Sept. 11th with a scar, or as a sad reminder of what happened that day. Thankfully, it has always served as a source of happiness, inspiration, and as a momentary reminder that Sept. 11th won’t be marred with only tragedy. Although, every time I play the record I clearly remember everything that I experienced, from the moment I woke up to the time I went to bed, no different than the first time all those people remembering hearing a new Beatles song on the radio for the first time. It’s just one of those things. I’ve always been curious to know what was going through Dylan’s mind on that day. What was he thinking the day his latest album dropped, when obviously bigger things were going on? As a person who has seen and been a part of so much history over the last several decades, his commentary would be interesting to hear. The last ten years since that day seems to be surreal in itself, that our lives have been in a bit of a fog or haze as we continue to piece together some sense of such a tragedy. It’s a lot to think about, and ultimately it’s too big for any of us to fully grasp. But, we all experience and process moments in our lives the best way we know how. I’m thankful for the people who have sacrificed time, health, family and life to make this world a better place, and I’m tremendously thankful for those who create joy for our world in times when others want to take it away. There is no doubt that all who lived and experienced Sept. 11, 2001 will always always remember the day in their own unique way. To forget would be a tragedy it itself. Thanks Bob, for giving us a little something special to cling to that day. This entry was posted on Sunday, September 11th, 2011 at 9:25 pm	and is filed under Music. You can follow any responses to this entry through the RSS 2.0 feed. You can skip to the end and leave a response. Pinging is currently not allowed.